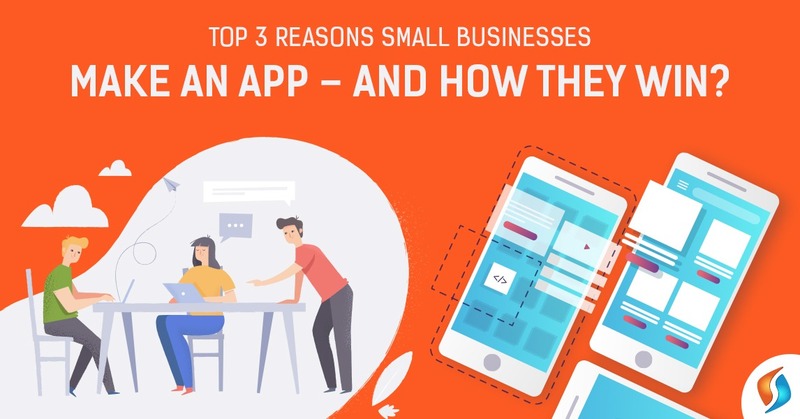 ﻿ Top 3 Reasons Small Businesses Make An App - and How They Win? Top 3 Reasons Small Businesses Make An App – and How They Win? A small business owner is hesitant to invest in new processes or new technology because the whole concentration is to increase the sales and make a brand. But in the heat of growing the business further, at times, founders forget to look at the advantages that a new technology can give to their business. 1. To improve customer service – through feedbacks, by offering new products or special package. 2. To boost sales – Being accessible and top of mind to your customers, Push notifications, a loyalty program that rewards repeat customers. 3. To successfully compete with other businesses – gain visibility in particular markets, gains respect in the customer’s mind, technology driven business. Now that you are making your mind to build an app for your business, consider a few things to get into the top 5% of app stores. The right code will give you high-performance, trouble-free system and latest API support. For small business, it is always good to start small and in phases. Do a pilot test on a single platform before the final launch and then look to SaS sites for multi-platform app development. Among three app sellers: Google play, App Store & windows Store; you must choose wisely. The revenue generated at the Apple App Store to Google Play is at a ratio of 8 to 1. Windows store is small but runs simultaneously on PC, tablet and smartphone – more mediums, more downloads. Google play apps are free and earns through advertising. Android apps get the highest number of downloads in a limited timeframe. The small things make a big difference. Lesser content and more of pictures attract the user. Make everything that fits in small screen yet looks spick and span. Be very sure about the content you are adding. Every word goes unnoticed here. The user gets irritated with the ads, so be transparent in it and choose an ad space which doesn’t disturb the user. Keep updating, but must have a reason. Your app must support as many devices as possible and responding to the user builds a rapport and generates business for you. Presentation is what makes you favorable. Screenshots of your app make a huge difference. The first three screenshots should highlight your app’s best instances! SEO plays a good role to boost your rating. Get featured in articles to create a brand. With a few tricks and right path, small businesses can monetize better than offline business. Every other person owns a smartphone, which makes it evident that how important is it to build a mobile app for your business irrespective of size. really helpful & it helped me out a lot. I’m hoping to provide something back and help others like you helped me. Gold, on the other hand, is the main resource of the online game. With its assistance, you can update all your cards as well as buy brand-new ones. Thanks for sharing your thoughts on business app for small businesses.